My nominations for the 2012 EduBlogs Awards are all about being inspired and helped throughout this year. Best group blog - Hawaii Book Blog (soon to be Hawaii Reads). Yes, I know it's a local blog, but Misty-Lynn and Alex give me hope for the future. Every state should have young people like these to carry on and spread the love of books and reading. Best class blog - Mrs. Yollis' Classroom Blog. Linda Yollis' seamless use of blogs to have her 2nd and 3rd grade students reach out globally is so inspiring. 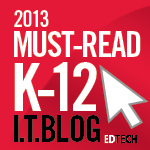 Best ed tech / resource sharing blog - Educational Technology and Mobile Learning. Med Kharbach does an excellent job of curating edtech tools. I consult this blog every day! Best teacher blog - Teaching Like It's 2999. I met Jennie Magiera at #GTANY and she is an educator on fire! She is forward-thinking and so enthusiastic -- a mover and shaker, IMO. Best library / librarian blog - A Media Specialist's Guide to the Internet. Every time Julie Greller (cybrarian77) comes out with a list of resources, I'm all eyes and ears. She has a real knack for finding the crème de la crème. Best administrator blog: A Principal's Reflections. Eric Sheninger's opinions are always thought-provoking. Creativity and Why It Matters is today's gem. Best individual tweeter @AuntyTech. Donna Baumbach leverages the power of her tweets by using twylah.com and rebelmouse. She's a frequent contributor to #TLChat. Her tweets are so useful! Best twitter hashtag #TLChat. This is my bread-and-butter go-to hashtag for educational resources that rock. I access it via paper.li. Best free web tool - Google Apps for Education. This ubiquitous, dynamic set of tools provides a solid online workplace for students to organize, create, collaborate, and publish. Empowering. Best educational use of audio / video / visual / podcast - TeacherCast. The brainchild of Jeffrey Bradbury, this network produces volumes of quality content. The variety of educational experts on the show is astonishing. 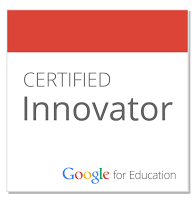 Best open PD / unconference / webinar series - Google EducationOnAir. This is a very well put together program by The Giant. The offerings are practical and Google+ Hangouts is such a fun way to participate. The topper is the Past Recordings archive, assuring us that we won't miss a thing. More, please! Best educational use of a social network - iPad Education Dreams. This Facebook group makes everyone an administrator (you can request to be invited). Created by Josh Reppun, this burgeoning group is a stellar example of how people who are passionate about an educational topic come together and generously provide support for one another. Best mobile app - TripIt. This handy little free app was recommended to my by a colleague this summer at #ISTE12 and I have been using it ever since. Takes the worry out of travel plans. Lifetime achievement - Jerry Blumengarten, the one and only cybraryman. My hero, 'nuff said. What about you? Who or what inspired you this year? Nominations are open until November 26, and here's a quick link to the form.